Also contributing to the Guide is Kyle Borrowman, M.Sc. student in Environmental and Life Sciences at Trent University, who is actively surveying the milfoil weevil’s presence in Ontario lakes. KLSA has commissioned further research on the Eurasian milfoil weevil in 2011. Results will appear in the KLSA Annual Report to be published in print and on this website in April 2012. A native aquatic weevil which lives exclusively on watermilfoil has been found in many of the Kawartha Lakes. 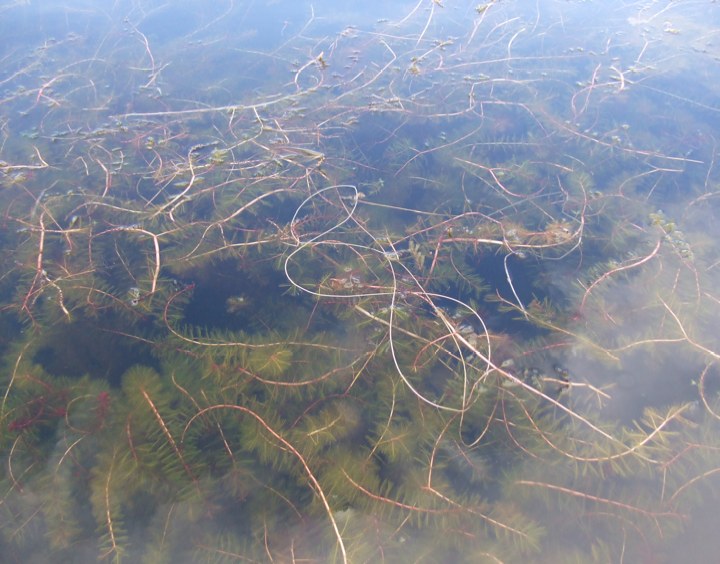 It shows promise as a biological control mechanism for the invasive Eurasian watermilfoil. However natural weevil densities do no typically reach levels that cause significant declines of Eurasian watermilfoil. This leads to stocking or augmenting native weevil populations to levels that can cause significant declines. Currently, there is no legislation that allows the release of the milfoil weevil into the Kawartha Lakes, other than for research purposes. If release were permitted, stocking lakes with this weevil would be expensive, costing upwards of $10,000 per initial stocking. Because it appears to be so effective, however, collaborative efforts among applicable authorities and those groups who are affected may be merited. Further study is needed. Eurasian watermilfoil (Myriophyllum spicatum, herein referred to as EWM) is an invasive aquatic plant that has become widespread throughout North America, including many lakes and water systems in Southern Ontario. Millions of dollars are spent every year on this continent on physical and chemical management techniques to control nuisance populations of milfoil.1 Many of these methods are expensive, provide only temporary results and may have negative impacts on the surrounding ecosystem. * Mesotrophic lakes commonly have clear water, with beds of submerged aquatic plants and medium levels of nutrients. A eutrophic body of water has excessive nutrients and is subject to algal blooms resulting in poor water quality. The bottom waters of such bodies are commonly deficient in oxygen. Eutrophic waters commonly lack fish species like trout which require cold, well-oxygenated waters. Eurasian watermilfoil is a rooted, submersed, perennial herb with finely dissected leaves.3 These leaves are located along the stem at every node in whorls of four. Leaves become dense toward the upper portions of the plant and around the stem. Each dissected leaf generally consists of 12 or more paired divisions. Flowering consists of tiny pink flowers that develop on red spikes that stand above the water. Winter buds can also occur and are often red or green in colour.5 The stems of younger shoots are green in colour; as they grow they turn beige and resemble spaghetti in appearance. Each leaf resemble a feather with threadlike leaflets on either side of a central axis. 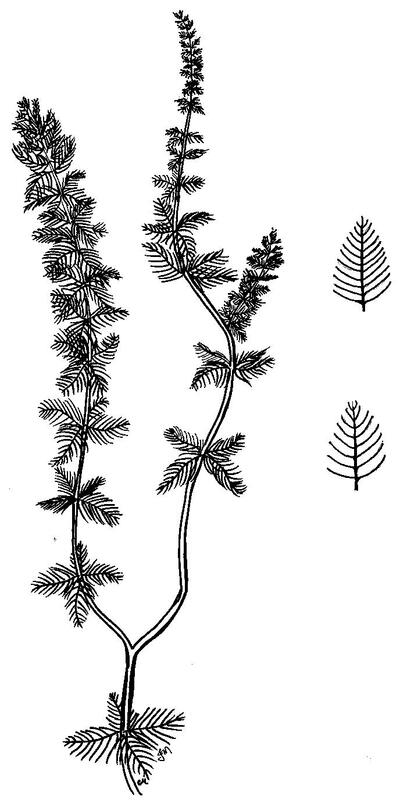 Eurasian milfoil has 12 to 20 leaflets on each side of the central stem (upper drawing). Northern milfoil, which is native to the Kawarthas, has 11 or fewer on each side (lower drawing). Drawing by Colleen Middleton and Jessica Middleton for KLSA. Despite their similarities, it is possible to make somewhat accurate identification of EWM and northern milfoil in the field. The lack of winter buds on northern watermilfoil and the number of leaf segments per leaflet are the most distinguishable differences between the two. Typically, northern watermilfoil consists of leaflets with less than 12 paired divisions whereas EWM consists of more than 12 paired divisions. 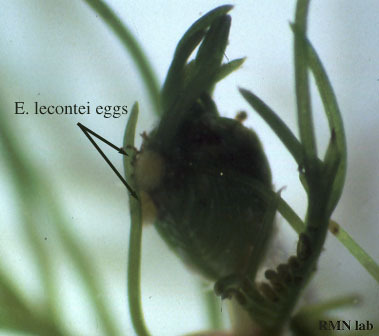 Five leaves of EWM become closely arranged towards the apical meristem* of the plant; this is not as noticeable in northern milfoil. 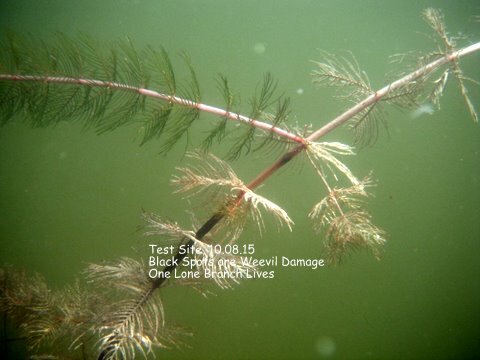 In addition, when pulled out of the water, leaves of EWM typically collapse onto the stem where as northern milfoil is somewhat rigid and the leaves hold their form out of the water. Since identification can be difficult, we encourage people to collect samples or take pictures of the plant in question (including close-up pictures of the leaves, stems and flowers if possible) for identification by scientific advisors who work with our association. Consider uploading your pictures to KLSA’s Facebook page. *Meristem: undifferentiated plant cells, an area where growth can take place. Chemical methods such as herbicides are usually effective but a last resort due to the harmful effects on the environment. Herbicides used for aquatic plant management are often broad spectrum and do not target specific plant species. The use of such herbicides could be detrimental to beneficial native plant and invertebrate communities. In some cases, such as treatment of Hydrilla spp., herbicide application has led to the production of resistant plant strains and the need for stronger herbicide dosage. Some herbicides that have been used to manage EWM include: 2, 4-diclorophenoxy, fluridone, triclopyr, diquat, and endothall dipotassium salt. Diquat is the only herbicide used inOntariowhile the others are heavily used in theUnited States. The milfoil weevil is visible to the naked eye, although it takes a bit of training to spot one. The best way to observe the weevil is to snorkel through the milfoil patch focussing on the upper 30 centimetres of the milfoil plants. Weevils are about the size of a sesame seed, (two to three millimetres long, with a typical “weevil like” elongated nose (proboscus) and a yellow shell with black blotches or stripes. The underside (abdomen) is silvery in colour; in sunny conditions the silvery flash is what gives away their location. Weevils are very active as adults moving, feeding and mating as they travel along the stem or meristem of the plant. Not only are these critters small, they are also somewhat elusive, much like a squirrel around a tree. Milfoil weevils use the stem as cover to avoid predation and in some cases will play dead until they feel the threat has passed. This is often noticed when observing weevils in a sample tray. 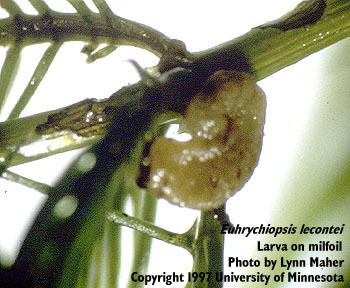 Other signs of weevil presence are milfoil stem damage and the presence of eggs. These are easily viewed by collecting stems of milfoil (by snorkelling or by boat), then submersing them in water in a white tray. Stem damage consists of stem burrowing and pupae chambers. Burrowing is caused by feeding during the larval stage; the plant stem is hollowed out and sometimes breaks off. It is very noticeable when held up to light. Sometimes larvae can be spotted within the stem or along the outside of the plant. Pupae chambers form later in the life stage and further down the stem, typically 30 to 50 cm below the meristem. This will appear as a dark spot and bulge with a pupating weevil inside. 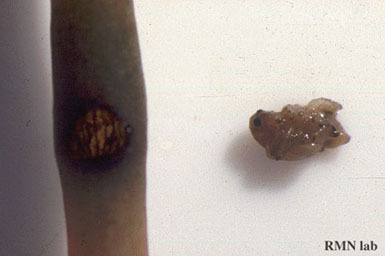 If the adult has emerged from pupation, the dark spot will become a circular or elliptical hole about the size of an adult weevil. Weevil eggs are typically laid on the plant meristem and upper layers. They are yellowish, elliptical and about 0.5mm long. Eggs are difficult to see and are sometimes confused with blobs of algae, which have a fuzzy appearance compared to the solid colour of the weevil eggs. The adult weevil can grow to be two or three millimetres long at this final phase. They have been recorded living up to 162 days in laboratory studies.¹⁹ Females lay their eggs upon the apical (top) meristem of their host and can produce two to four eggs daily with a maximum of five generations per summer. Adults primarily feed upon the milfoil’s leaves but also eat stem tissues. Seasonally, the last generation of adults refrain from reproducing; instead, they store energy for development of wings and fat stores. This prepares them for the overwintering process, which has been observed occurring in leaf litter and other organic matter near the shoreline. Weevils typically overwinter on shore in the top five centimetres or so of leaf litter, dry duff and soil. A study by weevil expert Raymond Newman in Wisconsin found highest overwinter weevil densities one metre from shore; at some sites it was not uncommon to find weevils overwintering on land up to six metres from shore. This is reassuring for weevil survival in the Kawarthas, where water levels change dramatically in November and April. If they are still on land, weevils have been reported to head for the water shortly after the ice goes out, and have been collected on plants at this time. It is when water temperatures reach 10 to 15ºC that weevils begin to actively feed and reproduce. It takes about a week at 15ºC for a female to lay eggs. Other literature confirms that weevils should be in the water by mid-May. This seems to be a safe time for shore dwellers to rake up accumulated debris, without fear of removing precious weevils. Choosing a host plant: native, Eurasian or hybrid? The weevil is a selective diner. It lives only on watermilfoil plants, and does not spread to others. It is endemic to North America, which indicates that its original host plant choice was the northern watermilfoil. The spread of invasive EWM across North American regions has allowed EWM exposure to the milfoil weevil. Laboratory studies have revealed that weevil growth and development occurs over a shorter period of time on EWM in comparison to northern milfoil, and EWM is preferred over its native counterpart for egg laying.2, 10 Further studies have found hybrids of Eurasian and northern watermilfoil occurring throughout Ontario and the midwest United States. This includes several of the Kawartha Lakes (Lower Buckhorn, Pigeon, Scugog and Stony) as well as theRideauLakes system. In laboratory studies milfoil weevil performance on hybrid milfoil is intermediate in comparison with EWM and northern milfoil. Currently, there is no legislation that allows the release of the milfoil weevil in theKawartha Lakes, other than for research purposes. Under the Fish and Wildlife Conservation Act section 54 (1) (Release of Imports), “except with the authorization of the Minister, a person shall not release wildlife or an invertebrate that has been transported intoOntarioor has been propagated from stock that was transported intoOntario.” However, this Act does not apply if an import permit is issued by the Canadian Food Inspection Agency. Budgeting can be the one factor that contributes to the success or failure of EWM biological control methods. As discussed below, the cost can be prohibitive. However investment in biological methods for control of the EWM plant and for spread prevention are reasonable considerations for communities troubled by this nuisance species. Open communication with all five parties is essential at all times in any project. The science of biological control is a public-interest science, which means that practitioners need to understand the public and cultivate public support for their work.16 The public’s perception of the potential risks and benefits associated with biological control methods plays a key role in the success or failure of a project. How people perceive risk is key. In biological control, risk is measured by quantifying potential damage to the public, such as the sport fishing industry, or to beneficial native plant species such as wild rice, through a risk assessment process. Ethics is not often discussed in the context of biological control programs, despite the fact that ethical and emotional decisions must be made when considering the release of any biological control agent. For control programs to be ethical, all reasonable alternatives must be listed and people choose objectively among them to compare the consequences of actions.17 This helps to inform and reassure everyone involved. There are a number of things that biological control scientists can do to quantify, predict and minimize risks. Proper risk assessment is vital to the success of any proposed project. One way to assess public interest in biological control methods is through a survey. Surveys give the public an opportunity to voice their support, ask questions and share concerns about invasive species and control methods. The Kawartha Lakes Stewards Association invited 350 members to take a survey on invasive species control during a two week period spanning February and March of 2011, hosted on SurveyMonkey.com. 90 of the 350 people completed the survey, a response rate of 25.7%. This rate is very high, and indicative of the interest level amongst KLSA members. Of those who completed the survey, 77% have noticed an increase in the presence and/or density of Eurasian watermilfoil or other aquatic plants in recent years (Figure 8). 69% polled are able to identify Eurasian watermilfoil, but only 47% are aware that a native aquatic insect, the milfoil weevil, can be used to reduce the abundance and density of Eurasian watermilfoil in lakes. It is interesting to note that 100% of participants consider the problem of invasive, exotic plants to be important or very important. These results indicate that people are concerned about invasive aquatic plants. 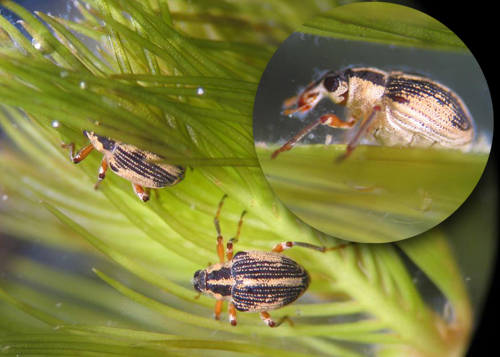 Use of the milfoil weevil to control Eurasian watermilfoil in theKawartha Lakescomes with a number of ecological, economic, regulatory and social considerations. All four of these spheres must be considered from the outset of any project, and all stakeholders should be included in the discussion from the very beginning. Based on our research into the ecology, feasibility, and regulatory considerations of using the weevil to control Eurasian watermilfoil in the Kawartha Lakes, here are recommendations for any group wishing to pursue this form of biological control. Map the location and density of Eurasian watermilfoil in this area. This will help to determine where the problem areas are, and where research should be focused. Disseminate information on biological control of Eurasian watermilfoil by the milfoil weevil toKawartha Lakesresidents. This will better inform the public of the problem of invasive species, and the potential of biological control methods. Hold an information session to discuss the project with potential stakeholders and residents who may be affected by a biological control project. Deal with concerns and considerations that come to light, before the implementation stage. 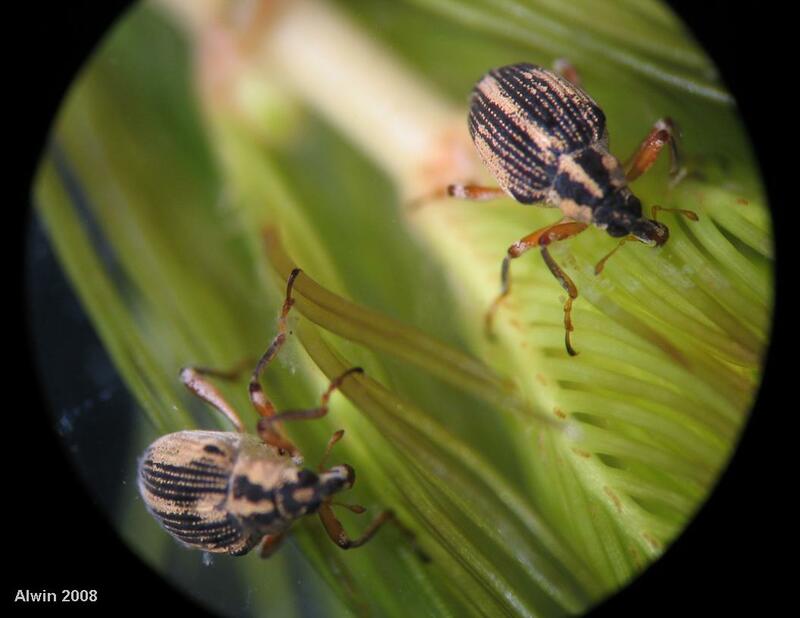 Encourage invasive species scientists to produce more research on weevil control programs, the establishment of baselines for monitoring, and long-term effects. Encourage legislation that allows the release of the milfoil weevil in the Kawartha Lakes, other than for research purposes. This will require collaboration to produce a studied and persuasive case for further biological control projects. Contact other lake associations throughout the United States and Canada to inquire about their weevil stocking experience. Establish a lead authority to pursue recommendations prompted by this report. 1. Richardson, R. J. (2008). Aquatic Plant Management and the Impact of Emerging Herbicide Resistance Issues. Weed Technology, 22, 8-15. 2. Newman, R. M. (2004). Biological Control of EWM by aquatic insects: basic insights from an applied problem. Stuttgart. 159-166. 3. Smith, C.S & J.W. Barko. (1990). Ecology of EWM. Journal of Aquatic Plant Management, 28, 55-64. 4. Borrowman, K. (2011). EWM: Life History, Habitat and Management. Trent University, unpublished data. 6. Moody, M.L. & D.H. Les. (2007). Geographic distribution and genotypic composition of invasive hybrid watermilfoil (Myriophyllum spicatum× Myriophyllum sibiricum) populations in North America. Biol. Invasions. 9(5): 559-570. 7. Creed, R. (1998). A Biogeographic Perspective on EWM Declines: Additional Evidence for the Role of Herbivorous Weevils in Promoting Declines? Journal of Aquatic Plant Management, 36, 16-22. 8. Newman, R. M. & W. G. Inglis. (2009). Distribution and Abundance of the Milfoil Weevil, Euhrychiopsis lecontei, in Lake Minnetonka and Relation to Milfoil Harvesting. Journal of Aquatic Management, 47-57. 9. Jester, L., Bozek, M., Helsel, D. & S. Sheldon. (2000). Euhrychiopsis lecontei Distribution, Abundance, and Experimental Augmentations for EWM Control in Wisconsin Lakes. Journal of Aquatic Plant Management, 38, 88-97. 10. Roley, S. & R. Newman. (2006). Developmental Performance of the Milfoil Weevil, Euhrychiopsis lecontei (Coleoptera: Curculionidae), on Northern Watermilfoil, EWM, and Hybrid (Northern X Eurasian) Watermilfoil. Environmental Entomology, 35(1), 121-126. 11. Mazzei, K. C., Newman, R. M., Loos, A., & D. W. Ragsdale. (1999). Developmental rates of the native milfoil weevil, Euhrychiopsis lecontei, and damage to EWM at constant temperatures. Journal of Biological Control, 16, 139-143. 12. Newman, R. M., Ragsdale, D. W., Miles, A. & C. Oien (2001a). Overwinter habitat and the relationship of overwinter to in-lake densities of the milfoil weevil, Euhrychiopsis lecontei, a EWM biological control agent. Journal of the Aquatic Plant Management, 39(1), 63- 67. 13. Sheldon, S. & R. Creed. (2003). The effect of a native biological control agent for EWM on six North American watermilfoils. Aquatic Botany, 76, 259-265. 14. Madsen, J. D., H. A. Crosson, K. S. Hamel, M. A. Hilovsky, and C. H. Welling. 2000. Panel Discussion – Management of Eurasian watermilfoil in theUnited Statesusing native insects: State regulatory and management issues. Journal of Aquatic Plant Management 38: 121-124. 15. Cushing, N. (2011). EnviroScience Inc. Telephone Conversation. 14 February 2011. 17. Delfosse, E. S. (2005). Risk and ethics in biological control. Biological Control, 35, 319-329.